The production process involved identification of objectives and student and faculty user outcomes. The intended audiences of the National Forage and Grasslands Curriculum were determined to be undergraduate college students and college instructors of Forage and Grasslands courses. A minimal knowledge of forage production and management was assumed for student users. Faculty were expected to have masters or doctoral level training in forage and livestock systems. To develop a standardized curriculum content that covers the essential components of forage and grassland management through the participation of national experts. To place that content within an appropriate instructional design and supplement with graphic arts and communication tools. 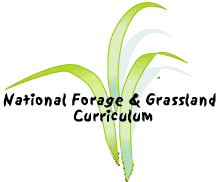 To integrate the National Forage and Grasslands Curriculum within the broader scope of the Forage Information System. Will access materials that will reinforce and illustrate key concepts presented in lectures and laboratories. Will access material that will allow them to review or test their knowledge level in a particular topic. Will access materials that will help them teach a forage class using a variety of teaching methods (these materials will include suggested teaching methods, suggested class activities, images, sample quiz/exam questions, suggested laboratory activity ideas, links to other forage related websites, and reference lists). The curriculum encompasses a semester length course in Forage Production & Management consisting of 21 major topic areas. Each topic has both instructor and student materials sections. How materials can be used: The National Forage and Grasslands Curriculum can serve as a comprehensive information source for forage-related classes or as supplementary teaching materials for student and faculty in the area of Forage Production & Management.